The thought of Grammy winners The Blind Boys Of Alabama is almost too perfect. 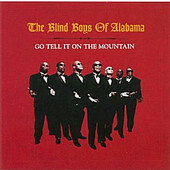 Six blind men from the south churning out the most soulful songs ever written with a whole slew of well known, highly regarded guests, is what features on Go Tell It On The Mountain. Featuring everybody from Tom Waits, Aaron Neville and Shelby Lynne, to Michael Franti, Me'Shell Ndegeocello and Solomon Burke, the line-up is stellar and most appropriate for the tracklisting. Assistance on a number of tracks comes from John Medeski on the Hammond organ as well, adding an important and powerful spiritual vibe to the Boys' sound. The songbook selection is inspiring, choosing hymns like "Joy To The World" (with Neville), "Away In A Manger" (with George Clinton and Robert Randolph) and "Little Drummer Boy" (with Franti), all done in a style that stays true to their roots. With a 60 year history behind them, The Blind Boys are a true institution of music and Go Tell It On The Mountain is a record that should be embraced by all as soon as humanly possible.